Step 1. Begin with half a watermelon & scoop out as many rounded scoops as you can, placing them in a large bowl. When the watermelon is hollowed out, fill it with ice. This will be a convenient display and holder for your snow cones. Step 2. 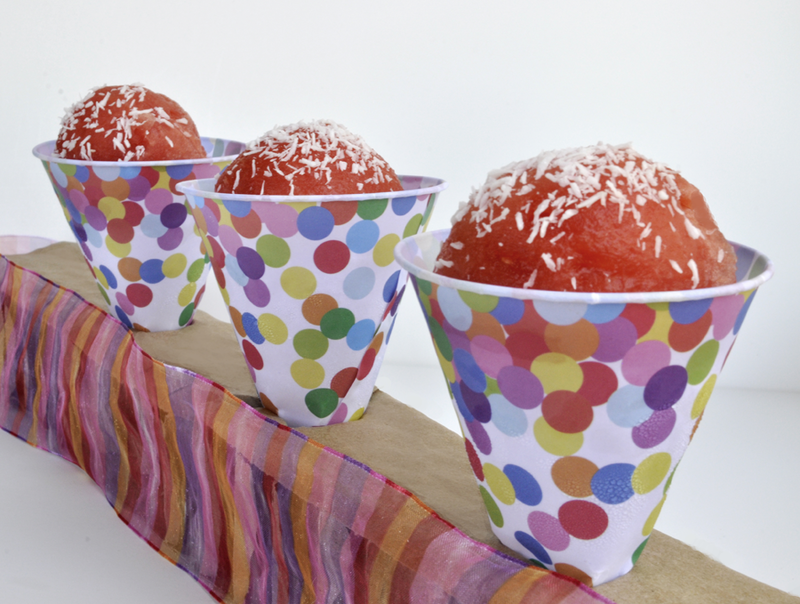 Fill snow cone cups with crushed ice until 1/2 to 3/4 inch below the rim. You can pour watermelon puree (2 cups cubed watermelon pureed) over the ice or leave the ice plain. Step 3. 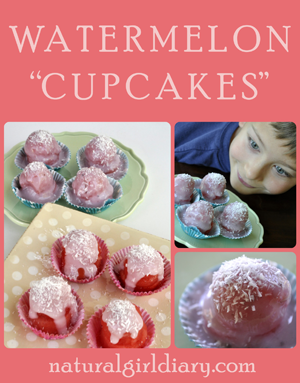 Place scoops of watermelon on top of ice & sprinkle with shredded coconut. For a final fun touch, place a berry on top! Step 4. 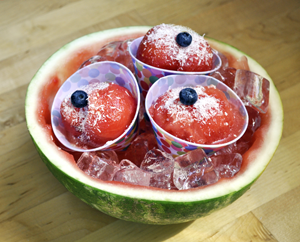 Set snowcones in your hollowed out watermelon for display and WOW your kids! Begin with a 3/4 inch to 1 inch thick slice of watermelon. Using a small circular cookie cutter, punch through melon to make the bottom part of the cupcake. 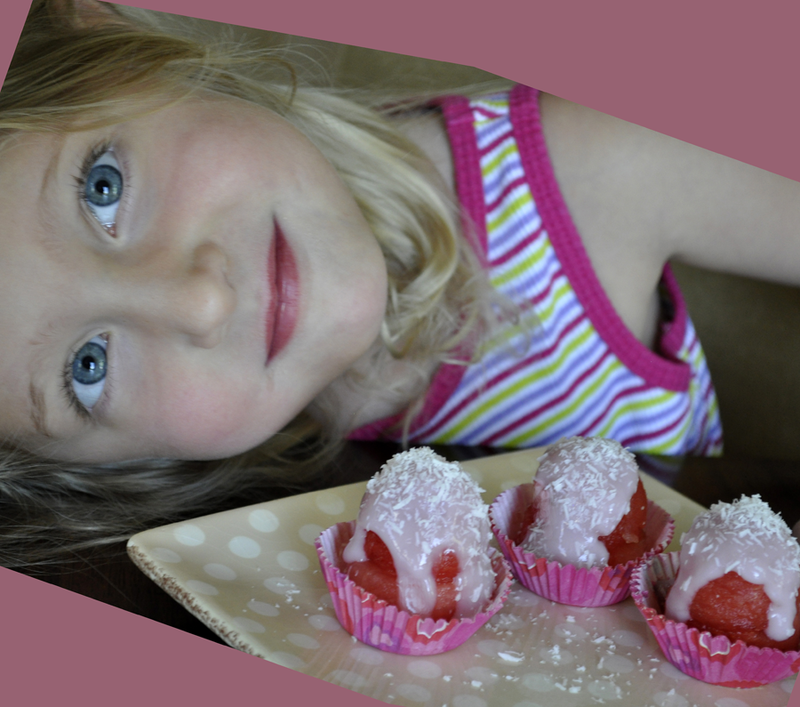 Assemble bottoms & tops in mini cupcake liners. I use SO Delicious brand coconut milk yogurt for the "icing" ~ blueberry for purplish icing & strawberry for pink. To increase the brightness of the pink, puree with a few strawberries prior to "icing". Spoon yogurt over the top of each cupcake ~ just a little to make it drip down the sides or more to cover completely. Sprinkle shredded coconut over the top to make it festive! Step 8. Serve and .... Enjoy!